A gender just, equitable and self-reliant society where women have access to and control over financial and other resources. Building capacities of rural poor especially women and youth by promoting and strengthening self-reliant and sustainable institutions to enable them to led the process of development for a better quality of life. Our programs are mutually reinforcing and try to address social issues in a holistic manner. However, to aid understanding, we have tried to classify our efforts into three inter-connected layers as illustrated in the diagram. Grassroots: Activities in which we directly work with the community. Capacity Building and Research: Activities in which we try to build capacities of individuals or institutions who, in turn, work with the community. Networking and Policy Advocacy: Activities in which we learn from and share our experience with the various stakeholders of the SHG movement. 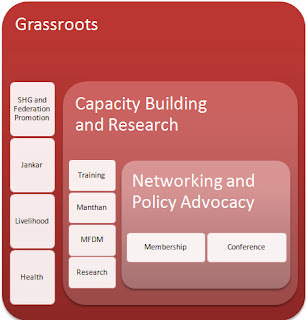 Although all our activities in each of the layers are equally important to us, we strongly believe that continuous learning from our grassroots activities helps us in designing effective capacity building programs and correctly influencing required policies. Follow our blog - http://thelivelihoodjournal.wordpress.com/ to read about best practices in rural livelihoods; documented from a practitioner's viewpoint.